Foosa Moon Creations: Grand Opening and Sale!!! 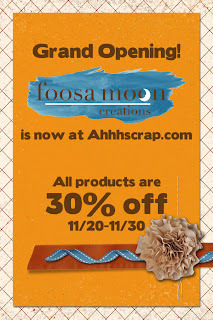 I've been hinting at some big news over on the Foosa Moon Facebook page, and the time is here to announce -- I am opening up shop at Ahhhscrap.com! I am over the moon excited to join the design team at Ahhh Scrap. The grand opening will be announced in the store newsletter on Monday, but I just couldn't keep it to myself any longer! In celebration of my opening, my whole store is on sale for 30% off through the end of this month! 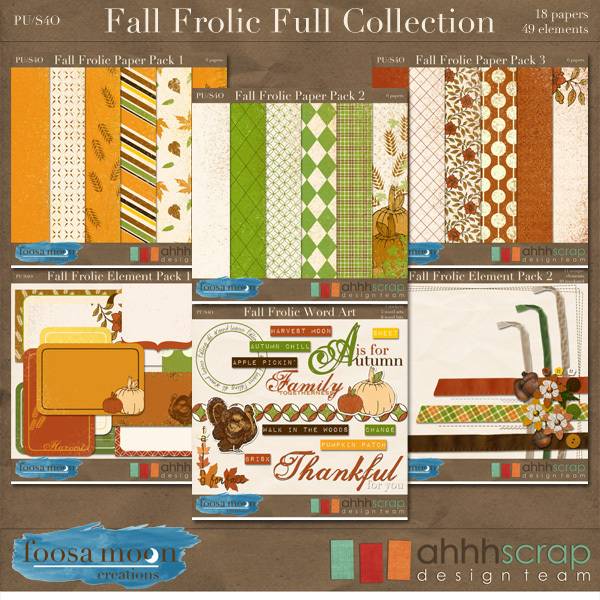 I have loaded up 2 kits to start, Fall Frolic and an expanded version of Cream & Sugar (previously seen during the Design Factor challenge this summer). Cream & Sugar is available as individual pieces (kit, alphas, and word art) or as a complete bundle. Fall Frolic is available as individual packs (3 paper packs and 3 element packs) or as a complete bundle. Also, remember the link for Bats, Cats, & Hats will expire tomorrow...it's well enough past the Halloween season that I am taking this down. But be on the lookout for even more new kits and pieces soon!